The new Cisco AP2700 provides state of the art Gigabit Wi-Fi via the support of Wave 1 802.11ac at a very attractive price point for business environments…be it for Enterprises, Healthcare, K-12, Higher Education, Manufacturing, Warehouses, etc. The Cisco AP2700 emerges on the market as an ideal on-premise solution, second only to AP3700 Series, Cisco’s best-in-class 802.11ac Access Point with its modularity and truly flexible architecture. The Cisco Aironet 2700 Series offers all the advantages of 802.11ac available with Cisco’s innovative High Density Experience(HDX) technology, which includes features such as CleanAir 80MHz, ClientLink 3.0, Optimized Roaming, Turbo Performance and RF Noise Reduction. It offers the unique antenna design unmatched by anyone else. It offers the toughness with industry leading design, while allowing customers to leverage existing mounting brackets–an extra plus for those customers who are refreshing their old technology/older generation Access Points. 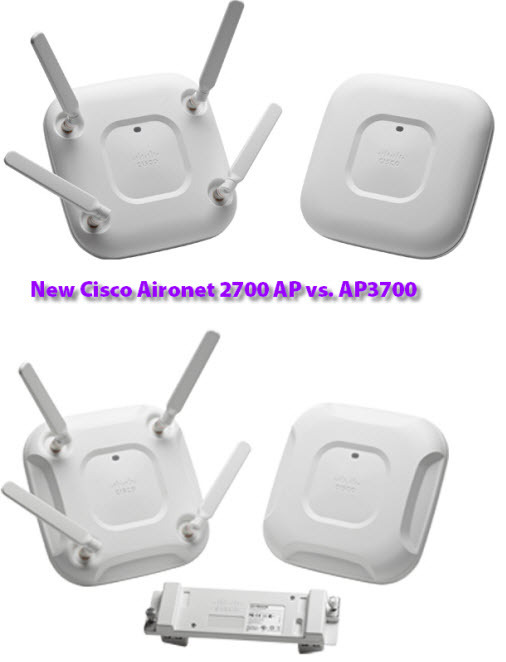 Cisco AP2700 and AP3700 Series are building out a Cisco portfolio that cannot be matched by anyone else out there. Combine that with the robust end-to-end Enterprise Mobility solution that only Cisco can bring to the market and our customers are set to take on the mobile trend in high density environments. This is going to be an exciting time in the industry moving to Gigabit Wi-Fi and we are happy to be bringing the best products and solutions to help our customers with the toughest technology challenges.